After our night’s rest at the Phantom Ranch, our agenda item today is the climb up to the South Rim. 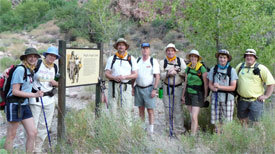 Our group poses as we leave Phantom Ranch. Colorado River on the pedestrian bridge. to get this photo of Dad chowing down. "strings out" a bit as we hike up the trail. not far from the Bright Angel Lodge. We were up around 4 a.m. to be on time for our 5 a.m. breakfast. Well, Garrett and Matt were actually up during the night, too, since Garrett was not feeling well. Most likely he was worn out from yesterday’s hike since he did not take a nap like the rest of us did. Breakfast was good with pancakes and scrambled eggs and plenty to drink. At 5:33 a.m. we were ready to go. We walked to the edge of the campground for a group photo, just in time to see a mule train arriving from the South Rim with the day’s supplies for Phantom Ranch. I don’t know what their travel time was – maybe two hours or so, so they left pretty early in the morning. After leaving the campground we had about a quarter mile to walk before we reached the Colorado River and pedestrian bridge across the river. 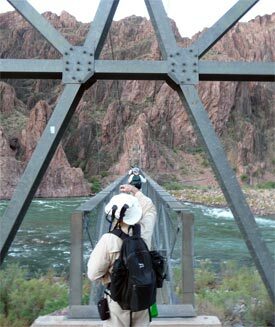 There is another older bridge about a half mile upstream that is part of the South Kaibab trail. 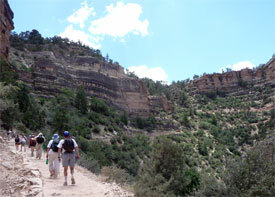 We took the Bright Angel trail since it has 3 water stops, and the Kaibab trail has none. After crossing the bridge, we walked our first 30 minutes parallel to the river before we cut back into the trail away from the river. The first couple of hours were pleasant, the temperature was still relatively cool and the switchbacks made the climb easy. We were quite surprised when we reached Indian Garden, which is the half-way point from Phantom Ranch to the South Rim. At Indian Garden we took a 30 minute break and had some food, some of which was out of the sack lunch that we had gotten back at Phantom Ranch. A pesky squirrel got into Lynette’s backpack and ran off with her bag of peanuts. We told her she was not allowed to feed the animals and we were going to report her if she didn’t get her peanuts back. She was able to recover them. About that time a park ranger arrived – he was hiking to the nearby Ranger Station. He said that the squirrels around the rest stops are pretty bold because they know that people have food with them. After our break we headed out for the last half of the climb. Fortunately we were heading up, so the temperature was not rising as much as it did yesterday. But by about noon it was 90 F (32 C). The next two water stops were nicely spaced, and we had several shorter breaks in-between. We weren’t drinking just water, either – we had energy supplements in powder form to add to the water. About 3 miles from the top Ted gave Garrett a mint that helped calm his stomach and he felt better. His quote of the day to his mom was "Why didn’t you force me to eat that earlier?" after the mint seemed to work. In contrast to yesterday, there was plenty of "traffic" on the trail today. Most people who hike down to Phantom Ranch do so from the South Rim, and a number of people take day hikes part of the way down and then back up. So we leapfrogged some of the same people more than once on the way up as they took their breaks and then we took ours. The last mile or so was not a particularly difficult climb, but being the last mile of 24 it seemed so. We seem to increase our drink breaks as we approached the top, and finally we had made it to the South Rim. 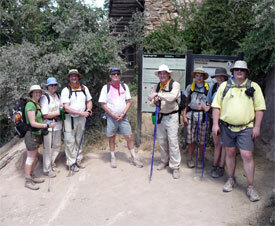 We had hiked another 9.6 miles (14.6 km) today, climbing some 4460 feet (1359 m) from Phantom Ranch up to the South Rim. Ted’s comment was appropriate: "It was the hardest thing I did so far, but also the neatest." For me this was a close second to the Bonn marathon, which was harder. A big thanks to everyone in the group for participating, and a special thank you to Lisa for making all the arrangements including spending a couple of hours on the phone when she called to make our reservations at Phantom Ranch. Glad to see that you guys got to experience hiking the Grand Canyon. I’ve always been in awe of the canyon since my first experience there (to the North Rim) in 1954, during a break from my summer job in Springdale, Utah. 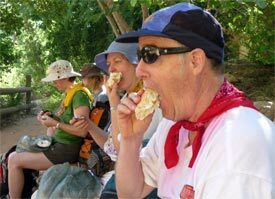 My last hiking trip there, (with Meghan, Dave & Beth), was in January, 2004. We had snow the last couple of miles up Bright Angel trail.